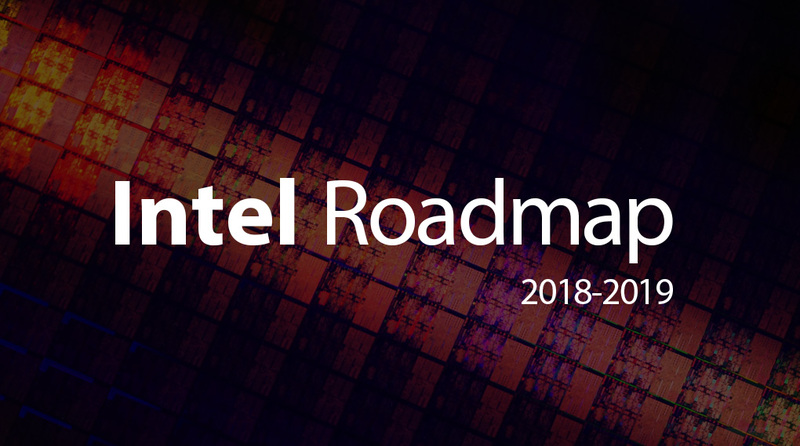 We were the the first ones to tell you about the existence of the Core i9-9900k and the Z390 platform, so I think its only fair that we tell you about its actual release schedule as well – along with the complete consumer product roadmap from Intel. Some rumors have been circulating about Intel’s 8-core mainstream processor being delayed to next year and I thought it was worth pointing out that they are completely inaccurate. The reason being that the roadmap slides in question are vastly outdated. So without any further ado, here is the latest Intel desktop roadmap for the years 2018 through Q3 2019 that some birdies left behind. Before we begin, a few housekeeping rules. This is the latest product roadmap from Intel, which means we know exactly when Intel expects to start the production roll-out of specific platforms. Announcements usually happen after this point in time so do keep that in mind. It also goes without saying that this is the plan as of right-now and Intel can change its mind whenever it damn well pleases. The first thing you will notice is that Intel has divided its consumer processors into four distinct categories: A, X, S and N. The highest end segment is now the ‘A-Series’ processors’ category, followed by ‘X-Series’ processors, ‘S-Series’ processors and ‘N-Series’ processors. X, S, and N is something we are already intimately familiar with so the major takeaway here is that the company is rolling out its 28-core part in a brand new market segment. This also naturally means that we are looking at a different chipset and socket. Intel’s plans and roadmap for the year 2018 through Q3 2019. The A-Series platform is part of Intel’s ongoing effort to expand the TAM (Total Addressable Market) and furnish new market segments to cater to. The ultra high-end segment is one such case and is something AMD is trying to court too. The A-Series processor lineup currently only includes the 28-Core, but it’s possible that Intel will expand this into more SKUs (there is room for quite a lot of SKUs considering the flagship part is an 18-core right now) after the launch of the flagship. Production is scheduled to begin sometime in the middle of Q4 but we should see the platform hit the shelves before the year is over. As of right now, Intel has not decided on a concrete launch date. Intel Basin Falls is the standing HEDT platform which currently hosts its flagship part: the Core i9-7980XE. Forming the X-Series processors, It has also been informally dubbed the Skylake-X lineup. Basin Falls is all set for a refresh soon and we have the exact date with us. Production roll out window will start on 4 November 2018 through 1 December 2018 and it is immediately after this time that we should see SKUs hit the shelves. The announcement, however, will happen a bit earlier, in October 2018, along with the Coffee Lake-S platform. Basin Falls refresh will retain the X299 chipset and that means backward compatibility with existing motherboards. We expect the parts to remain essentially the same with better binning allowing for slightly higher turbo frequencies. The Glacier Falls platform (dubbed Cascade Lake-X) is going to be the true successor to Basin Falls and is slated to start production roll out by early Q3 2019. The exact weeks are 1 July 2019 through 21 September 2019. If we don’t see Intel expanding the A-series lineup with more SKUs, it is here that we should see the remaining high-end CPUs appear (with core counts between 18 and 28). Moving on to something that we have been talking about for quite some time now: the Coffee Lake-S platform. Intel’s Core i9-9900K will be the first time that the i9 branding has landed in the mainstream (S-Series processors) and will also represent the company’s first octa-core processor for the same segment. Unlike what some rumors have suggested earlier this week, the Core i9-9900K has not in fact been delayed and is on schedule for early Q4 2018. Production rollout will begin on 9th September 2018 through 6 October 2018, and the announcement is expected by October 2018. Now here’s the interesting thing, we had previously only heard about the 8-Core and the 6-Core parts as far as CFL-S goes but the roadmap states 4-Core and 2-Core parts as well. This is, of course, something that anyone familiar with yield theory was expecting to happen (quad-core and dual-core parts are simply too profitable to skip over) so isn’t really surprising but does confirm that the lineup will not just consist of Core i9, i7 and i5 brandings – i3 is there as well. The TDP of the Core i9-9900k will be 95W, with the rest of the SKUs following the well-tested 65W and 35W philosophy. 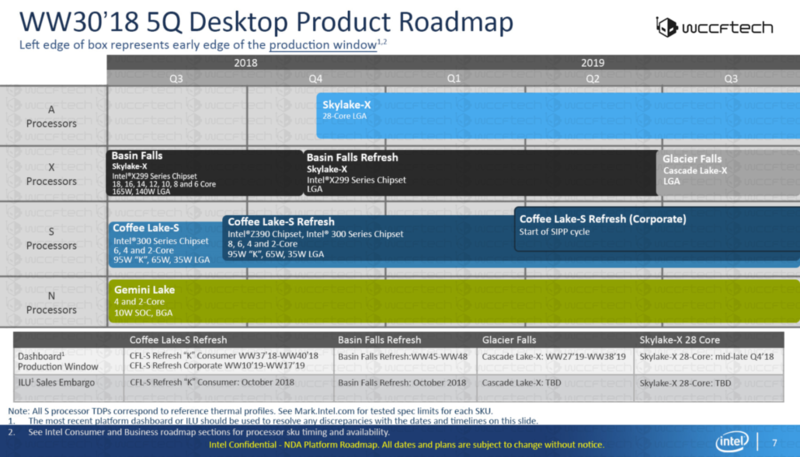 The Coffee Lake-S refresh for the corporate side will begin by the end of Q1 2019. Lastly, we have Gemini Lake, which forms Intel’s N-Series processors. Shipping in BGA packaging and featuring a tiny SOC design with just 10W TDP, this is the low-end mainstream platform from Intel that is targetted towards mobile and niche use case applications. Intel does not expect to roll out any successor to the platform up till Q3 2019.